Mini Exercising Cycle is a unique concept to exercise while at work, having rest, talking to someone, watching television, playing games on television or laptop. -Ruggedly built tubular steel frame stands solidily on four rubber tipped properly balanced legs. -Adjustable standard cycle seat and handle. -Fitted with one hard rubber tyred cycle wheel and standard chain. - Sprocket for bicycle drive. Banking on the skills of our qualified team of professionals, we are involved in providing Mini Exercise Cycle. 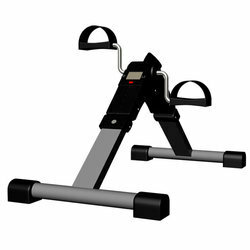 We offer you simple and economical and life long cycle exerciser, do all the exercising at home, watching TV, reading newspaper, or discussing important family matters, no worry about rains, or sunshine, and do all the morning walks right in your drawing room. Hip pain can be a debilitating condition. Osteoarthritis and necrosis are two bone diseases that affect strength and mobility in your hips Strength and range of motion exercises help improve joint function. 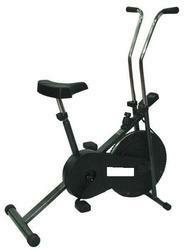 We offer Mini-Cycle Exercise Bike to our clients.